Wheelchair Basketball is a fantastic sport that is fully inclusive, no matter whether you are a wheelchair user or not you can play. 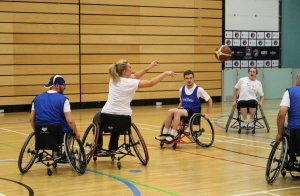 Derbyshire has lots of opportunities to play Wheelchair Basketball at both a recreational and competitive level. There are two hub clubs and one main club that are open for anyone of any age or ability to play. 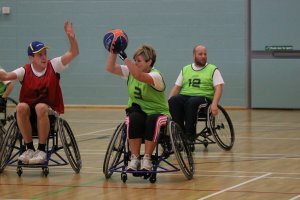 The Derby Wheelblazers are an established club that offer sessions on Sundays for a range of abilities and welcome anyone from a complete beginner to a more advanced player. Read Robin Gaze's story of his pathway from player to coach. The Chesterfield Hub will be re-launched at Chesterfield Tennis Centre on Tuesday 9th May - all ages and abilities are welcome. Sessions run: Tuesdays 7.00pm - 8.00pm, £2 per session. The Amber Valley Hub Club is based in Heanor at Heanor Gate School and is run in partnership with the Amber Valley School Sport Partnership. Wheelchair Basketball is a sport that can be played by anyone, watch the video below to see a range of different people playing the game together including Derbyshire's own Madeleine Thompson. You will see amputees, paraplegics, people with Causalgia (CRPS) and people with no disabilities whatsoever all playing together. Within the competitive game, everyone is ranked on a point system depending on their disability so all abilities play together, for more information on this and the sport in general visit the British Wheelchair Basketball website, click here. See what it's like to play Wheelchair Basketball with some experienced players.